Creating with Christine: Stonewall Crop Sneak Peek! I'm so excited about my upcoming Stonewall Crop!! My helpers and I are busy planning workshops, games, and goodies to make your weekend away even more delightful! Assuming no one cancels, my crop is officially full! However, if you missed out and would really like to attend, contact me and I will put you on a waiting list. There are always last minute cancellations and I'll do my best to make room for you! We have decided on a Spring Theme this year! 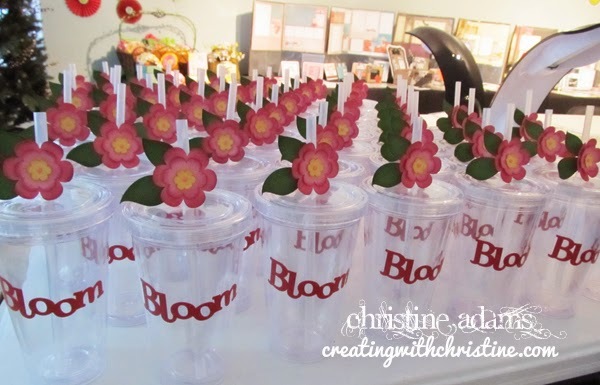 Even though it will likely be frosty, inside we will be working with bright, fun, spring themed projects in anticipation of the Spring Bloom that will be just around the corner! Stay tuned to this blog for crop workshops that you can sign up for! If you sign up in advance, you are guaranteed a kit at the crop. I will order a few extra just in case, but you may not get one if you wait. So be sure to reply to the workshops that you are interested in so I can prepare a kit for you! I will start posting them on Monday morning! This looks so inviting. Happy New Year.